A top Kurdish counter-terrorism and intelligence officer in Iraq has denied claims that Abu Bakr al-Baghdadi, caliph of the Islamic State, is dead. Russia stated last month that it killed the ISIS leader in May during an air raid on the outskirts of Raqqa. Weeks later, Iran confirmed his killing. Since the Russian military announced that it has eliminated the ISIS leader together with other senior aides during an air raid, there has not been any official message from the extremist group denying or affirming the claim. However, reports in Iraq last week alleged that Baghdadi was killed in an air strike in the Iraqi province of Nineveh. 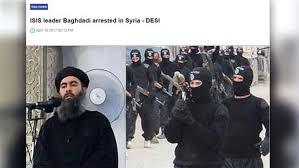 Director Rami Abdel Rahman of the Syrian Observatory for Human Rights also stated that “top tier commanders from IS who are present in Deir Ezzor province have confirmed the death of Abu Bakr al-Baghdadi, emir of the Islamic State group”. Talabany thinks that Baghdadi is hiding in southern Raqqa, Syria. He also thinks that the terror group is changing its tactics and defeating it completely could take about three or four years. There are speculations that the group will be headed by former intelligence officers under Saddam Hussein if Baghdadi is confirmed dead. Written by: Jaber Ali on July 17, 2017. Posted by Jaber Ali on Jul 17 2017. Filed under Headlines, World News. You can follow any responses to this entry through the RSS 2.0. Both comments and pings are currently closed.